Congratulations to our member of the month, Kimberly Hoffman!!! Kim has been with us for about a year and a half now and has been steadily improving her strength and skills in the gym throughout this time. Since her start, she has been a steady member of the noon class, and shows up ready to work and have a good time with the noon crew around her. Always sharing a laugh, she still helps to push those around her and in turn they push her to do her best. This is really what CrossFit is all about and we couldn’t be more grateful that she is a member of our community. 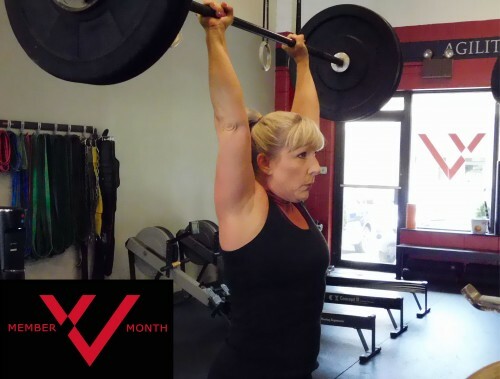 Kim had a big month last month, hitting 5 PRs between the Shoulder Press and Deadlift!! She has been putting up some great numbers, and we are excited to see how she progresses over the rest of this year and long into the future. Below are a few fun facts about Kim. It is hard, it is demanding, and it challenges you mentally and physically! I was raised in a Polish (straight out of Poland) house and can speak a small amount of the language, and can sing the Polish national anthem (thanks to my Dad teaching me) – and I know some Polish curse words too…LOL!! I would like to be able to do a pull-up, kipping, strict whatever I can do I just want to do a pull-up darn it! I would also love to hit a 250# DL and/or a 230# back squat! Once again, congratulations go out to Kim for impressing all of us with her amazing energy and infectious personality. That is what it means to be the CrossFit Vae Victis Member of the Month. Check back next month for the next Member of the Month. We will once again be highlighting one of our great members that is killing it in the box.